Much has been made over Roger Helmer's defection to UKIP. Many UKIPPERS at the Spring Conference gave him a standing ovation with a smiling Mr Helmer clearly basking in their adulation. Helmer said: "The fact is that UKIP represents the values and interests of East Midlands Conservatives much better than Cameron's Tory Party does. "I believe I can do a better job representing those views and interests as a member of UKIP than I could in the Tory Party. "The European project is collapsing before our eyes, yet the three main parties remain wedded to the Brussels dream". Isn't it wonderful? Roger will be great for UKIP. Roger and Nigel make a wonderful team! I'm glad Roger has finally realised UKIP is his natural political home. I can't wait to start campaigning for him in 2014. He left the Tories because he realised they had betrayed Britain. Will he be joining the EFD? I hope so. He needs to be warned to keep away from Nikki Sinclaire and Mike Nattrass! And so on. Such are the views of the gullible! And doesn't the hypocrisy of UKIP's leadership make you sick. Remember when David Bannerman left UKIP to join the Tories? UKIP's leadership demanded that the MEP resign as he had betrayed the people who had elected him! And yet these very same people are now falling over themselves to welcome Helmer to the UKIP ranks! They have very short memories. Or is it just one law for UKIP and another for the rest? Roger Helmer has been an MEP since 1999. He was a commited supporter of the EU but believed that our relationship with Brussels needed to change. He was a reformist. He later became more euro-sceptic but, despite this, refused repeated requests to join UKIP. Sometimes, his replies were less than complementary about the party! So why did he jump ship? It all boils down to a sordid row over who was going to succeed him in the East Midlands. Helmer was planning to retire and wanted Rupert Matthews, his friend, to replace him. Tory Head Office had other plans! They felt that Mr Matthews was unsuitable. They also felt, quite rightly, that Mr Helmer should not be dictating terms over his successor. The farce continued with Mr Helmer threatening to remain the MEP unless he got his way. Head Office refused to budge and let it be known that Mr Helmer was 'extremly unlikely' to be re-selected as an MEP candidate in 2014. Helmer's gamble had failed and so he jumped before he was pushed. So there you have it. Helmer's defection had nothing to do with 'seeing the light' as one UKIPPER has put it to us. Helmer joined UKIP to spite the Tories after failing to dictate to them who should replace him. So what do UKIPPERS now feel about his deflection? Are they happy to be used by Helmer as nothing more than a way to thumb his nose at the party who refused to indulge his hissy fits and threats to resign? We note that Roger Helmer's ego is just as big as Nigel Farage's. And, like Farage, he is more than happy to throw a tantrum if he can't get his way. That should make for an interesting relationship as they both seek to be the 'Voice and Face of UKIP' on TV and radio! Indeed, there are already calls in certain UKIPPER circles for Helmer to replace Farage as leader. It has also been suggested that Helmer stand as lead UKIP East Midlands MEP candidate in 2014. We can confirm that some UKIPPERS in the region concerned are less than happy with this prospect! Mr Helmer has done very well out of the EU. 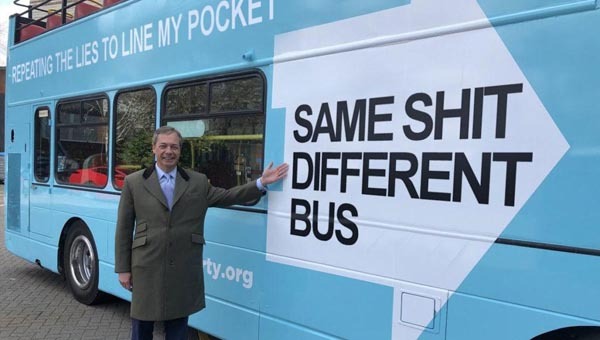 Some would say that he has joined UKIP's leadership because they are as self-serving and hypocritical as he is – ready to condemn the EU but more than happy to live very well on an EU salary - all at the expense of the UK taxpayer.